The property was charming and rustic. The neighbors were friendly and welcoming. We truly enjoyed our stay. All of my interactions with the MBPM staff were positive and professional, but Kyle exceeded expectations in every way. He demonstrated a superior level of diplomacy and professional acumen in communications and support. Both MBPM and Kyle deserve the highest recommendations. 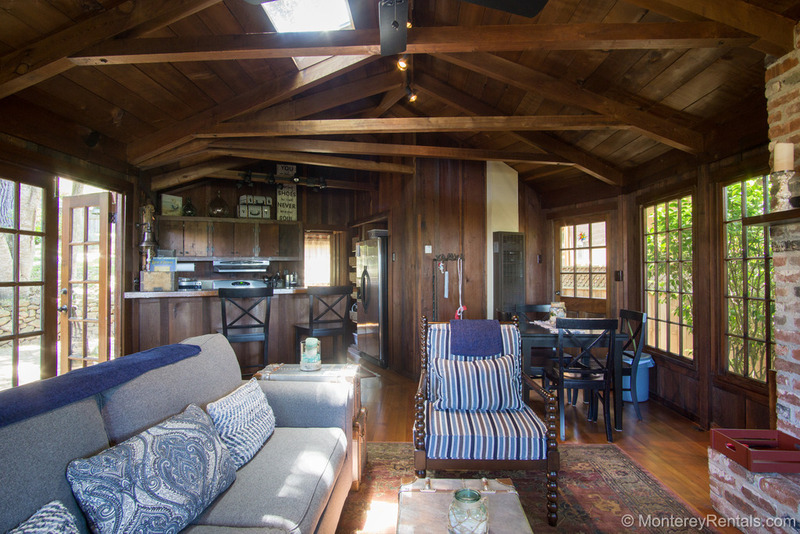 Located in a residential area of upper Pacific Grove, this rustic, single-wall cottage sits on a large lot surrounded by oaks and redwoods. Heated by a wall furnace, it has board and batt siding and mullioned windows. The master has a large flat screen TV, a King bed, a desk, and a private bath with a tub/shower. There's a gas fireplace in the living room, a compact kitchen (everything but a dishwasher), and a second bedroom and a bath with shower at the opposite side of the house. Safeway, Trader Joe's and numerous restaurants are less than a mile away, Lover's Point Beach and downtown Pacific Grove are within two miles, and there's easy access to Highway One, Pebble Beach and Carmel. This home an economical choice for a longer stay on the Monterey Peninsula.